Trailhead: We started from Pagoda Lodge, but in the town of Kerikeri, look for a large bridge found here. 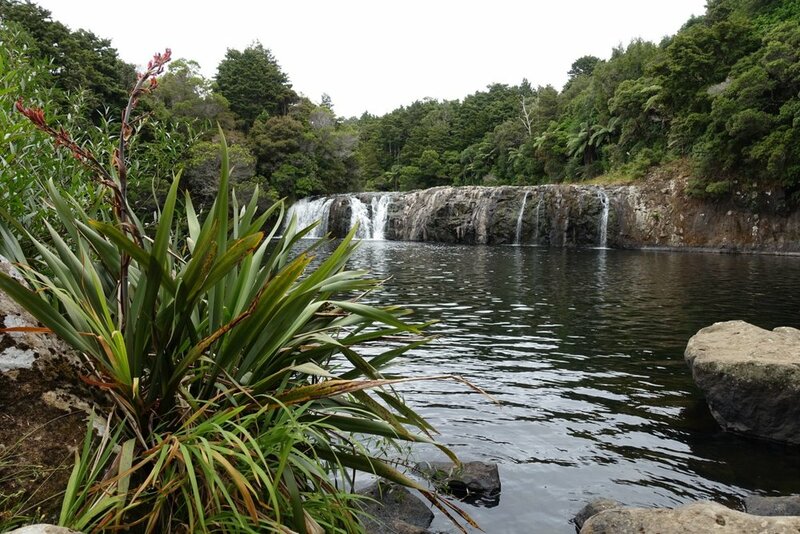 Rainbow Falls is part of the Kerikeri River Track that starts in town and ends at Rainbow Falls. It is a there-and-back hike that is a good day activity with anyone of reasonable fitness. There are 3 main stops along this track: the Historic Power House 15 minutes in, Wahrepuke Falls 20 minutes in, and Rainbow Falls 1 hour in. The walk starts gently following a river, where you can see some rope swings hung up for hot summer days. Soon you will reach the Power House which is a small sight. From there, Wahrepuke Falls appears. The falls are shorter but are wider and were nice for a quick stop. We didn't see anyone swimming here. The main event is Rainbow Falls, a beautiful waterfall that is probably even more beautiful when the river is flowing faster. It was a nice afternoon, good enough for hiking in shorts and a t-shirt. There were a few folks swimming, but it was more of a jump in and run out because the water is a bit cold. After stopping for some snacks and relaxing, we turned around and headed back to town.